Although none of the buildings are that tall, it's really nice to see the Central Square area adding a lot more density to the skyline. It'll be even better if and when they get the plot next to HMRC done (although we don't know what that is actually going to be yet) and the Interchange with the residential tower. On top of that Central Quay is really going to add to this, but it'll be a few years before it has much impact I think. Last edited by DJKiran on Sun Sep 09, 2018 9:40 am, edited 1 time in total. Ah, re. 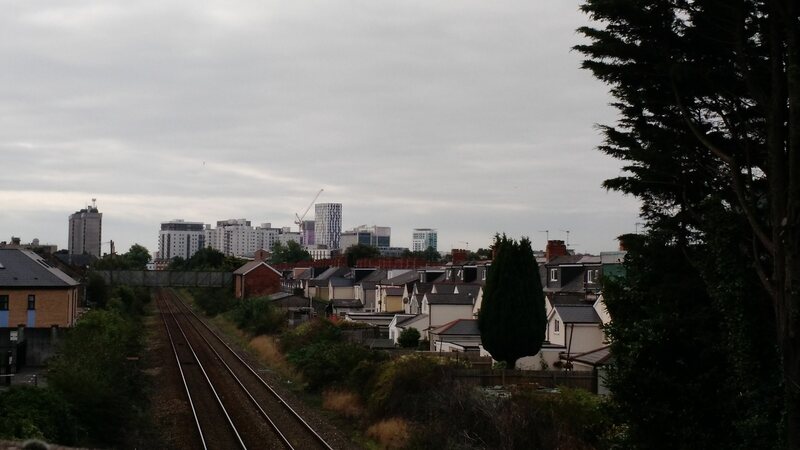 my earlier post, I should have realised that was taken from Crwys Road and not the Fitzroy Street footbridge. That's quite an impressive angle with the new developments included and if it wasn't for that sodding overgrown leylandii, Capital Tower (still by far my favourite tower in Cardiff), City Hall's clock tower and a distant Stadium House and the spires of the stadium themselves would be visible to the right of the cluster without the view being broken by said tree, as shown on Google Steetview. The Ty Mawr has a good view. Would recommend travelling further up the hill to get an even better view. View from the top of the Garth is pretty good, especially with binoculars. Excellent view over the city here and I'd like to see it now with the completion of the new towers, but I can't for the life of me work out where the photo has been taken from. Obvious somewhere to the west-northwest of the city centre, but where? That would make for a good skyline overview for Cardiff's Wikipedia page if it wasn't for the less-than-attractive (and unavoidable) roofs and streetlights in the foreground! neukreuz wrote: Excellent view over the city here and I'd like to see it now with the completion of the new towers, but I can't for the life of me work out where the photo has been taken from. Obvious somewhere to the west-northwest of the city centre, but where? It’s taken from Hill View in Pentrebane. That’s a good shot of the skyline in the banner today. I use an iPad rather than a computer to access the internet and my version of Google Earth has a very up-to-date representation of Cardiff - it looks to be from August. Bridge St is topped out and the Capital Quarter tower is very prominent. I’m not sure if this applies to other versions of GE. London and Manchester, on the other hand, are still languishing in 2016 with no sign of the dozens of topped-out and under construction skyscrapers in either city on Google Earth.